The junction between the clear cornea and the white sclera is called the limbus and is a circular line that separates them. Melanoma can arise from here and is also considered benign. Growth, however, can occur and is more common in young animals than in old where it may remain static. If progression is suspected and your dog, less commonly cat, is affected, you have 3 basic choices. First is to remove the affected tissue and then graft in a donor piece of sclera to replace the wall of the eye that was resected. This is the most aggressive approach and carries the benefit of the surgeon being able to hold the tumor in their hand once removed and hopefully confirm complete excision. The negative is the invasiveness of the procedure and the inflammatory reaction that must be controlled both inside and outside the eye after surgery. The second and third is ablation of the tissue using cold (cryosurgery) or heat (laser). The mass is typically debulked or shaved off and the remaining pigmented tissue is destroyed by placement of the probe over the mass and treating the area. 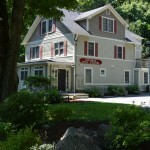 Although you are leaving tumor behind, this treatment is very successful, less invasive and reasonably well tolerated. The negative is that you are relying on your adjunct therapy to resolve the tumor rather than knowing you have completely removed it with resection. The area retains some pigment which has to be monitored for progression but usually remains a charcoal gray color. Both laser and cryo incur an inflammatory reaction to the eye which must be managed. Cryosurgery is my typical treatment of choice. The last option, especially in older dogs, is to measure, wait and watch as clinically they may not progress or progress quickly in which case there is little risk to leaving them there. 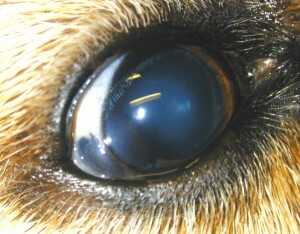 One of my favorite diseases in the cat is called a corneal sequestrum where the collagen of the cornea becomes discolored and turns a dark brown or black. It usually starts with a minor, poorly defined, tea-staining of the clear cornea, usually in the central region, and then progressively organizes and becomes more dense with well defined borders. 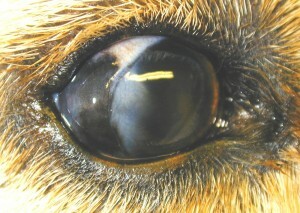 In its beginning stages, it is not uncommon to see this associated with a corneal ulceration. What causes this pigmentation? Well, three basic entities are related to sequestrum formation. The first is breed which implies a genetic predisposition. We will see these develop more commonly in the Persion, Himalayan and Burmese cat although any cat can get one. Second is due to any low-grade, chronic irritation. The most common of these would be entropion, or rolling in of the lids. 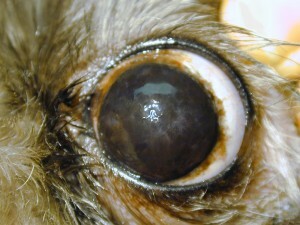 As the hair around the lid is directed onto the surface of the cornea, it is not uncommon to see ulceration and subsequent sequestrum formation that lines up with the offending hairs. 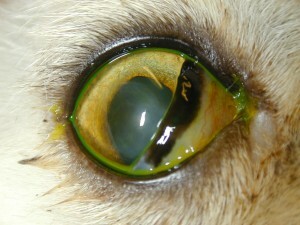 The last is our friend the herpes virus, the most common cause of surface disease in the cat, which creates ulcerative disease of the cornea with deposition of pigment in the ulcer bed. 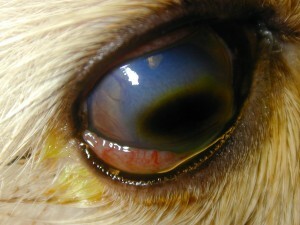 Treatment of corneal sequestra involves managing the primary problem (lid surgery if entropion, antivirals if herpetic, for example) and concurrently watching to see if the pigment dissipates or organizes. If an ulcerative problem is active and resolves, sometimes the tea color will dissipate as the ulcer heals. Sometimes the sequestrum will organize, develop sharp borders and the body will try to extrude or “kick it out” like a foreign body. This may take months but if the cat is comfortable, carries anesthetic risk for removal or has other issues to contend with, time may be on your side. If viral or genetic in basis, the ulcer may be difficult to heal, the eye remains painful and then this becomes a surgical problem. Surgery involves shaving off the pigmented region of the cornea (keratectomy) and, depending on the depth of the pigment into the corneal tissue, subsequent grafting. Grafting of the cornea is performed if we have a structural weakness due to thinning of the cornea as a result of tissue removal that is greater than 50% of the true thickness. It may also potentially decrease the chance of recurrence which is not uncommon in this disease. The method of grafting depends on the size and depth of lesion and includes conjunctival grafts and corneoscleral transpositions. 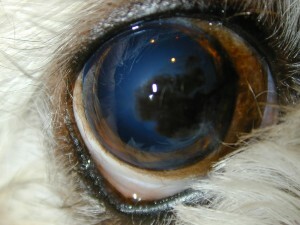 These methods are highly successful and result in a relatively clear cornea at the conclusion in the cat as we try to return to a comfortable and visual state. Chronic, low-grade irritation comes in many flavors in the dog. Usually, a combination of exposure issues, hair abnormalities, dry eyes and genetic predisposition can result in slow and steady deposition of pigment in the clear cornea. Thererfore, breeds like the Pug, Pekinese and Shih Tzu are frequent fliers to our clinic because of this constellation of problems. Surface disease may resolve but the pigmentary change may continue. Treatment involves resolution of the primary problem (lid surgery? hair removal? tear replacement?) then monitoring for progression of the pigmentary component. If advancement is obvious, then medications to try to dissolve the pigment or slow its advancement are utilized. These drugs, primary tear stimulants, are the only true medications we have in our armamentarium to halt pigmentation and their response is unpredictable and often limited. Surgical removal of the pigment is only a temporary treatment since the pigment returns quickly. Thus, procedures to minimize the exposure component and improve protection of the cornea or tear distribution may be used together to try and halt vision loss in these cases. As you can see, pigment in the eye comes in many forms so keep a look out and call if you notice anything that resembles these changes. Early diagnosis and intervention, as in most cases, may increase the possibility of a good outcome. Talk to you later! 4 comments to The Pigmentation Continues! GET THE HOTTEST REVIEWS ON ALL OF THE LATEST GADGETS OUT! !